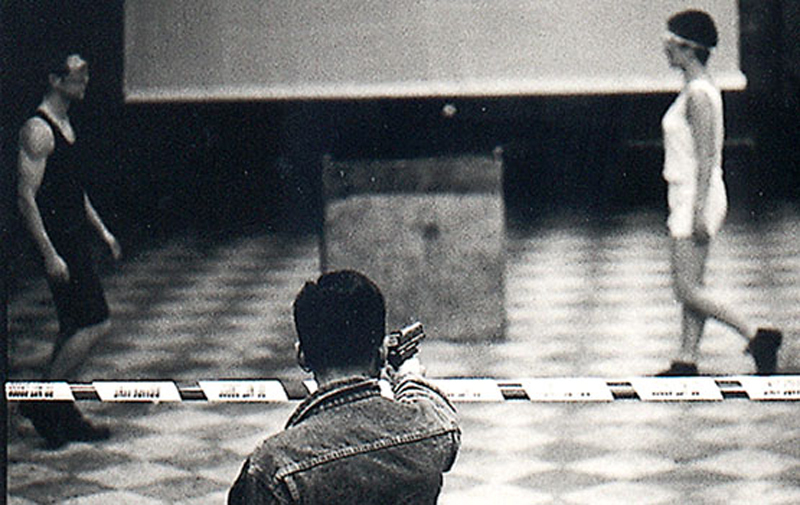 Our first work staged our obsession with killing. An event that is familiar but not known; a staple of casual drama, crime reconstructions and political horror. Gunmen Kill Three is threaded with stagings, presentations and simulations. It is arch and theatrical as it grasps for a moment of reality. Can the audience become witnesses? Made over the summer of 1991 by Matt Adams, Lorraine Hall, Niki Jewett, Will Kittow and Ju Row Farr in collaboration with Lucia Gahlin, Nicky Gibbs and Bruce Gilchrist. The development of the piece was prompted by an article in The Guardian entitled Gunmen Kill Three at Mobile Shop which described in detail how two men entered a mobile shop in a republican area and killed the two women behind the counter and a man who tried to intervene. Throughout the sequence of events the only words reported to be spoken was “IRA”. This was said by the protestant killers to reassure the two women moments before shooting them. The resulting work was first shown at Union Chapel in London in September 1991 alongside DJs, an installation in gold leaf and a bar run by the artists. It was subsequently shown at Sheffield Independent Film as part of the Sheffield Media Show and at Bournemouth Polytechnic. The actions in the piece break through the audience, we are constantly shuffled in the performance area as each component is highlighted and the scenario brought to bear, making the supposition of violence something the audience can participate in, expounding a feeling of reality: for a moment you are witness to some crisis or breakdown. Unapologetically voyeuristic this strategy pays off, it’s forever a snapshot, a precise moment you can feel. Structured around a re-enactment of the mobile shop killing, the piece featured live drumming, live wireless video projections, a sweep of the floor for evidence and an appeal for a missing child. A member of the audience was handed a paintball gun and offered the opportunity to fire at two performers in their underwear. If they chose to go ahead they were given three shots to make a hit. The piece ended with a monologue taken from Life After Life by Tony Parker in which a man describes bludgeoning someone to death with a hammer.